I can still remember that day. It was one of my early days in Delhi; I was sitting in an open air restaurant at Saket. Order was placed for food, we were waiting hungrily. Suddenly I noticed there were two plastic bottles filled with something green. A typical Bengali girl had no idea what was this, so she asked her hubby. He replied, don’t you know this is Hari chutney. Two bottles because there are two variations. One is ‘Dahi wala hari chutney’ and the other one is ‘Plain hari chutney’. To my surprise I tasted both the chutneys taking few drops from each bottle on my plate. Ummm the taste, I fell in love. So, after that day I started making this chutney regularly at home. This is a versatile chutney. And it goes well with almost everything. From sandwiches to chaat. From tikkis to tandoori. You just can mix or serve this chutney with anything for that extra taste. Very easy to make, and this can be stored in an air tight container for many days in the refrigerator. For ‘Roasted cumin (jeera) powder’ dry fry the cumin seeds on medium flame until fragrant, don’t let them burn. Let it be cooled. Now grind until fine in your mixer/grinder. Keep aside. 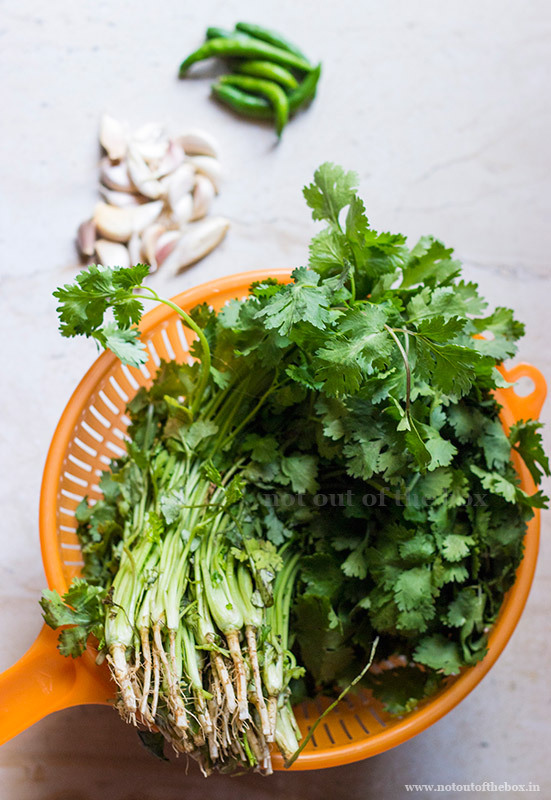 Chop the root parts off from the bunch of fresh coriander leaves. Place them in a colander, now wash well under running water. Chop the coriander leaves. In a mixer/grinder add chopped coriander leaves, garlic cloves and green chilies. Grind until a smooth paste forms. Add little bit water into this and grind further. Add water carefully, this chutney should be thick, not runny. Now transfer the chutney into a bowl. Add lime juice, chaat masala, salt and roasted cumin powder. Mix well. Your green chutney is ready to serve. This green chutney has to be little bit sour in taste. So you can add different ingredient to make it sour. You can add thick tamarind paste instead of lemon juice into this chutney. Yogurt can also be added. If adding, use 1 cup of whisked yogurt into this. Mix well and serve. 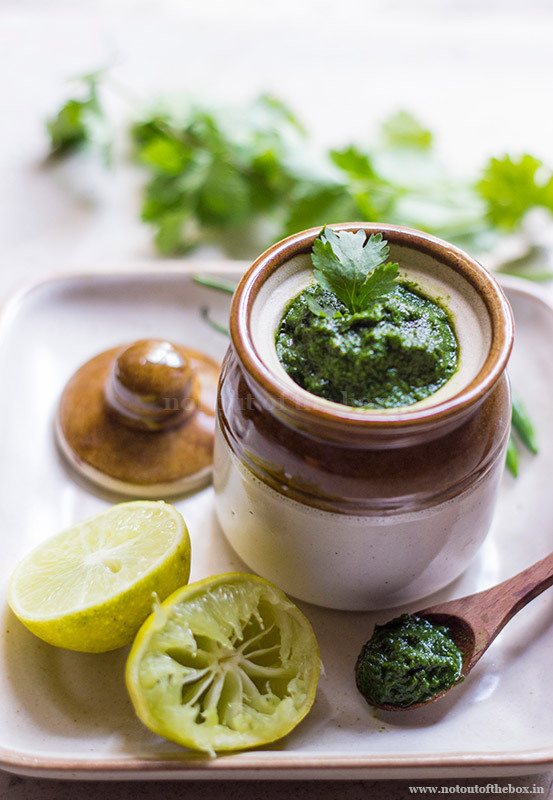 This variation of green chutney is best to be serve with any kind of snacks. 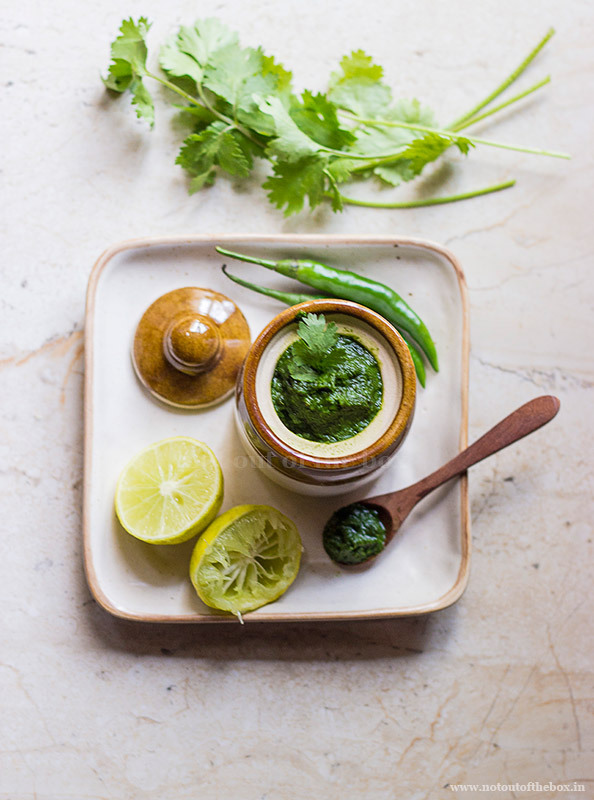 Green chutney is a staple in my home. I add ginger to it as well.. and the other variation is – take off garlic and add ginger, a small tomato and a small onion.